If you want to hear more about One Bridge, tune in to 102.3FM on Friday (we will be on sometime between 10-11am). You can also listen to it online by going to WGOW.com/fm. Special thanks to Jeff Styles for the interview…”El Jefe” is always a HUGE supporter of the arts in Chattanooga! Nice article in the Chattanooga Pulse today that talks about Three Sisters, Wine Over Water and One Bridge. No music this year, but you can hum to yourself during the 3rd Annual One Bridge Folk Art Festival. This open-air event will take place on the North Shore in the parking lot adjacent to Winder Binder Gallery of Folk Art. Almost two dozen local and regional artists will be participating in this year’s festival, including those working in paint, metal, glass, sculpture, mixed media assemblage, and printmaking. Free. Noon to 8 p.m. Saturday, noon to 5 p.m. Sunday. Next to Winder Binder Gallery, 40 Frazier Avenue. 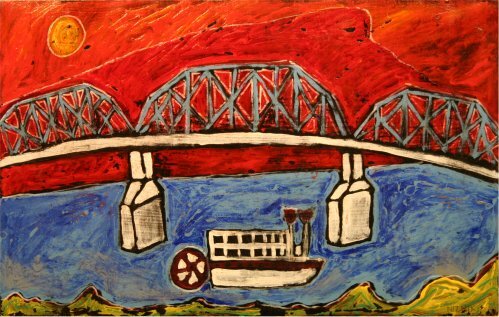 More info online at http://www.onebridgefolkartfestival.wordpress.com. Limited edition print by Charles “Niznik” Clendenin. 50 numbered and signed prints are available. Unframed $95, Framed $165.